Many a grown up can reminisce about building various architectural wonders in their youth. Forts, whether based on boxes or blankets, were the order of the day, and an excellent way to spend a rainy Sunday afternoon. It just so happens that there is no law against scaling up such activities once one has reached the age of majority. However, to build a structure at this level takes some careful planning and consideration, and that is the purpose of our article here today. To avoid an awkward conflict, be sure to warn your housemates of impending construction well ahead of time. The first major consideration when starting your build should be the area in which you wish to do it. Building inside has the advantage of avoiding the weather, however hard floors can lead to sore knees when crawling around. Additionally, you’re a grown up now, so it’s less likely your peers will be impressed to hear you sat inside a box in your living room. 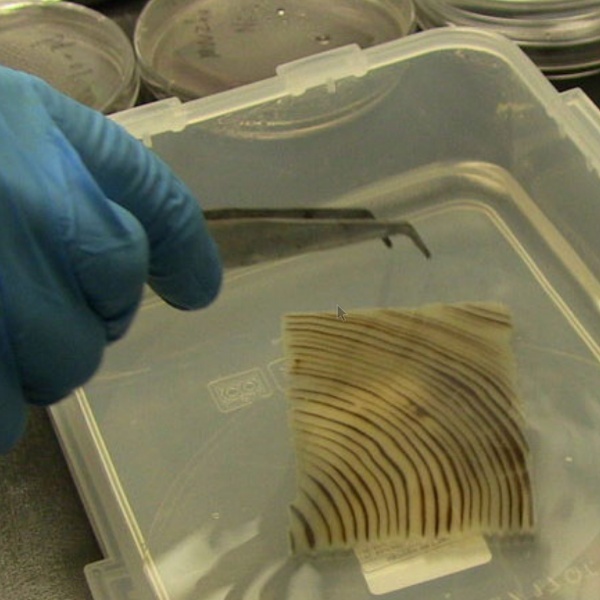 It’s not transparent aluminum, exactly, but it might be even better: transparent wood. Scientists at the University of Maryland have devised a way to remove all of its coloring, leaving behind an essentially clear piece of wood. By boiling the block of wood in a NaOH and Na2SO chemical bath for a few hours the wood loses its lignin, which is gives wood its color. The major caveat here is that the lignin also gives wood strength; the colorless cellulose structure that remains is itself very fragile. The solution is to impregnate the transparent wood with an epoxy using about three vacuum cycles, which results in a composite that is stronger than the original wood. There are some really interesting applications for this material. It does exhibit some haze so it is not as optimally transparent as glass but in cases where light and not vision is the goal — like architectural glass block — this is a winner. Anything traditionally build out of wood for its mechanical properties will be able to add an alpha color channel to the available options. The next step is finding a way to scale up the process. At this point the process has only been successful on samples up to 1 centimeter thick. If you’re looking to build a starship out of this stuff in the meantime, your best bet is still transparent aluminum. We do still wonder if there’s a way to eliminate the need for epoxy, too. [Saulius Lukse] has a really interesting way of turning a couple of buildings into his own addressable display. The effect is not seen in real life, but is a clever video rendering with stock he pulled from time-lapse cameras. 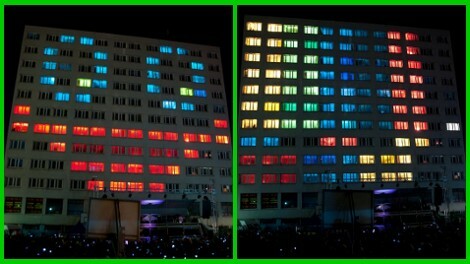 Now if you want to play Tetris using the windows of a building you add wireless lightbulbs to every window. But that’s a lot of work. You can fake playing Tetris (or scrolling messages in this case) if you just show a video of the buildings and swap in your own image manipulation. [Saulius] starts with a time lapse sequence of a city scape. It needs to be one with a large building or two to provide a good scrolling surface. The building is extracted from the scene with the background transparent. The really time consuming part is creating a distinct image with one window lit for each window that is going to be used. This set of windows are the ‘pixels’ used to create the scrolling images. This is accomplished by masking out one image of the building with every office light turned off, then masking out each window individually with the office illuminated. This masking means everything going on around the building (traffic, weather, people) will be preserved, while the windows can be individually manipulated. Next the program jinx is used to create the building animation. 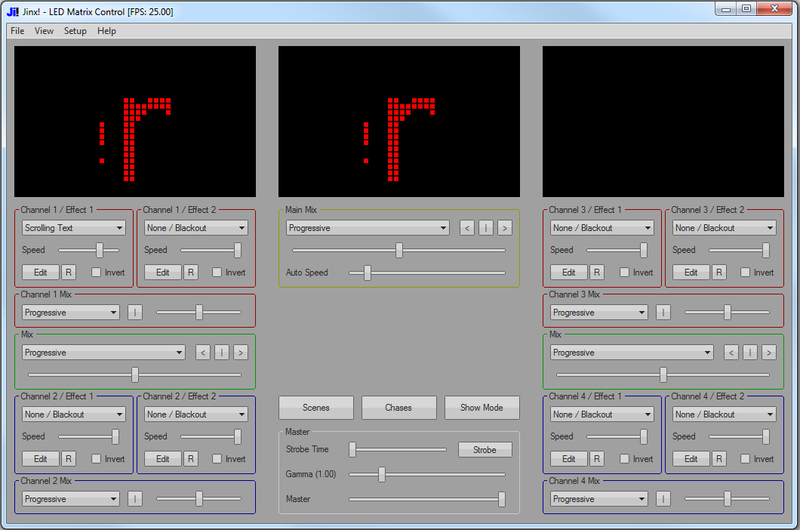 This program is designed to create scrolling messages on LED panels. [Saulius] provides a Python script that takes the images, the output of jinx, and combines them to create the final set of moving images. Sometimes you just want to build something quickly and easily. Maybe you just need a basic structure for your actual project, or perhaps you want to be able to easily modify the design. Maybe you don’t have access to many fancy tools to build a solid, lightweight structure. Another possibility is that you want to be able to break down your structure and move it at a later date. In cases like these, you might want to consider using lean pipe. Lean pipe is kind of like K’NEX for adults. It’s made up of metal pipe and specialized fittings. If you’ve ever worked with PVC pipe before then this may sound familiar. The difference is lean pipe is stronger and designed specifically for building sturdy structures. The fixtures designed for use with lean pipe are much easier to work with than PVC pipe. With PVC pipe, it seems like you never have the exact right fitting and you have to build your own adapters, quickly increasing the cost of the design. A typical lean pipe fitting will either slide over the end of a section of pipe, or wrap around it somewhere in the middle. An adjustment screw can then be tightened to clamp the fitting in place around the sections of pipe. The video below does a good job demonstrating the different possibilities with fittings. The primary issue with this material is that you might not be able to find it at your local hardware store. Luckily, a quick Internet search will turn up a number of online purchasing options. If you’ve clocked one-too-many hours at Tetris, it might be time to show the world your skills on this skyscraper-sized display on the Shell Centre in London. [Benjamin], [Tom], and their “army of volunteers” took to the Shell building and assembled their super-screen from a collection of 182 networked wireless lightbulbs, some tracing paper, and mylar to create a playable interface from the Jubilee Gardens below. [Benjamin] doesn’t deliver many of the technical details on his post, but he does give us an overview. He achieves full wireless coverage of all floors by spacing out 14 TP-Link WR702n routers, each running the same version of OpenWRT. This interface wasn’t [Benjamin’s] first choice, as he would’ve preferred to tap into the building’s existing wireless network; unfortunately, he was left without support from the building’s network team. 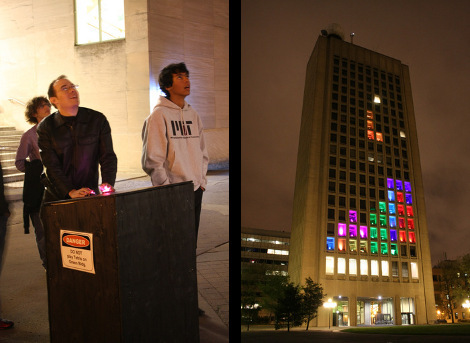 Equipped with a large donation of wireless bulbs controlled by a central bridge, [Benjamin’s] Python-adaptation of Tetris can refresh the building about about 1-to-2 frames per second. Given his description of the bulb interface, we suspect he’s using the all-too-familiar Philips Hue smart lightbulbs to illuminate the building. In case you haven’t heard of Faraday’s Christmas Lectures, they’re the UK’s nationally broadcasted “science special” featured at the end of the year and founded in 1825 by [Michael Faraday] himself. The goal of these Lectures is to introduce young people to some aspect from the sciences. We’ve seen giant Tetrises before, but not in a way that inspires such a young audience. We’re thrilled to see that hacking both in software (Python, LAN networks) and hardware (ZigBee, OpenWRT) made the cut for this year’s special. After all, why should MIT keep all the fun to themselves? If the building-scale is just too big for your taste, why not have a go on your oscilloscope?